This division of the Kilgour Sports Boosters is designed as a win-win. 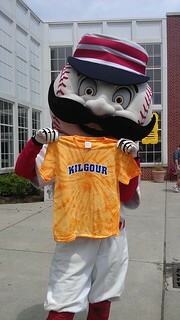 Show your Kilgour spirit at sports games, around town, and especially on Fridays at school! You can now buy Kilgour spiritwear online! CLICK HERE FOR OUR ONLINE SPIRITWEAR SHOP! When and Where Can I Buy Spiritwear In Person? Please visit the spiritwear table during the following annual school events listed below. We accept online payment through PayPal. Our spiritwear booth (see list above for sale dates) accepts credit card, cash, or check. Checks should be made out to Kilgour Sports Boosters. Please add 'Spiritwear' in the memo line if you are using a check. Please have your student wear Kilgour spiritwear every Friday. Counts will be taken each Friday of the number of children in each class that are participating. Each quarter, the Primary and Intermediate classes with the greatest percentage of participants will win a class party thanks to support of the Sports Boosters. Any and all effort is encouraged. Teachers have been instructed to count students on Fridays who make an effort, even if they do not own Kilgour spiritwear. 1st Quarter 2014-15: Mrs. Klosterman's class (Primary) and Ms. Bronner's class (Intermediate) each won a class party of their choice. 2nd Quarter 2014-15: Mrs. Foley's class (Primary) and Ms. Bales' class (Intermediate) each won a class party of their choice.